Statistics show unintentional death (accidents, injuries, poisoning, falls, etc.) as one of the 10 leading causes of death for babies and children ages 1-19. Some of these dangers can be reduced or eliminated by childproofing and babyproofing your home. Babyproofing your home is something most parents-to-be consider before the birth of their first child. But no matter the ages of your children, childproofing and babyproofing your home is a safety solution that minimizes danger zones in your house. It’s also something that is age-specific for your property, too. 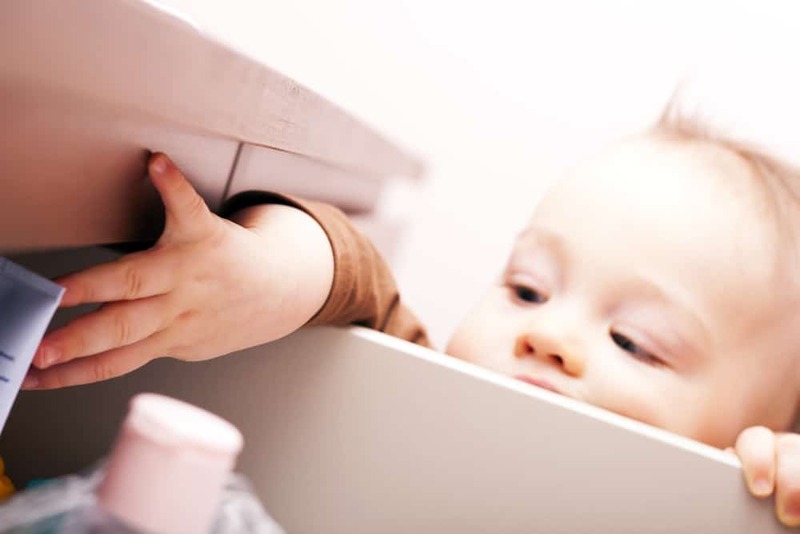 Choking risks – Anything small enough to put in a child’s mouth located in lower drawers or cabinets is a choking risk. Move small items to a higher space. Also, remove pet bowls after feeding time; dry pet food on the floor can pose a choking hazard. Crawl through the house – Visualize the world from their point of view. Scoot around the floor to see what dangers might attract a crawler/toddler. Electrical outlet covers – These can help keep prying fingers away from danger and give you time to relocate your child to a safer area. But they can be removed by crawlers and toddlers. If you’re concerned, call us to learn about tamper-resistant outlets so you don’t have to worry about covering your outlets. Furniture – Babies begin pulling themselves up on furniture almost as soon as they learn to crawl. Between 2000-2006, over 130 youngsters died from furniture tip-overs. Bolt entertainment units, bookcases, dressers, and any top-heavy furniture that could fall on a pulling-up child. Move heavy items to bottom drawers and shelves. Cover sharp furniture edges/corners with bumpers. Monitor visitors – Auntie Jane’s purse, dropped casually on the floor near the front door, can hold makeup, medicines, sharp objects – all hazards for a toddler. Poison potentials – Lock up every potential for poisoning. That includes cleaning products and medicines. Safety gate – Don’t pinch pennies when buying a safety gate! They should be easy for you to open and close and impossible for your toddler to open. At the top of stairways, use a gate that screws to the wall. Supervision – This is first and foremost the very best way to prevent accidents and falls. There are plenty of “gadgets” you can buy, but nothing replaces adult supervision. “I’d rather not recommend a product than suggest one that gives parents a false sense of security,” says Anne Altman, childproofing consultant. Window coverings – Cords on window blinds, etc. are frequent causes of strangulation in the U.S. Use cordless window treatments and don’t place baby’s crib or playpen near a window. Windows and doors – Keep them latched. Window screens do not prevent falls, and if you live in a high-rise, consider window stops or guards. Electrical babyproofing your home means making safety a priority for every age of your child, from infant to toddler to teen. Whether you’re building new this year or planning a renovation project, homeowners who want the best turn to Turn It On Electric for electrical solutions. Simply put, at Turn It On Electric we care about your home and business property. Safety and installation regulatory compliance is critical for our customers. We’re invested in the quality and integrity of our work because we live here, too. Sometimes we can provide over-the-phone estimates, so call us today to learn more about our electrical services.